2 Suspects Nabbed in Morningside! ANOTHER CRIME FREE MONTH IN MX40! We are delighted to announce that MX40 has remained crime-free since our last newsletter. This is a huge comfort and the result of vigilant security, informed domestic staff and careful residents! Wednesday 28 November at 10am. 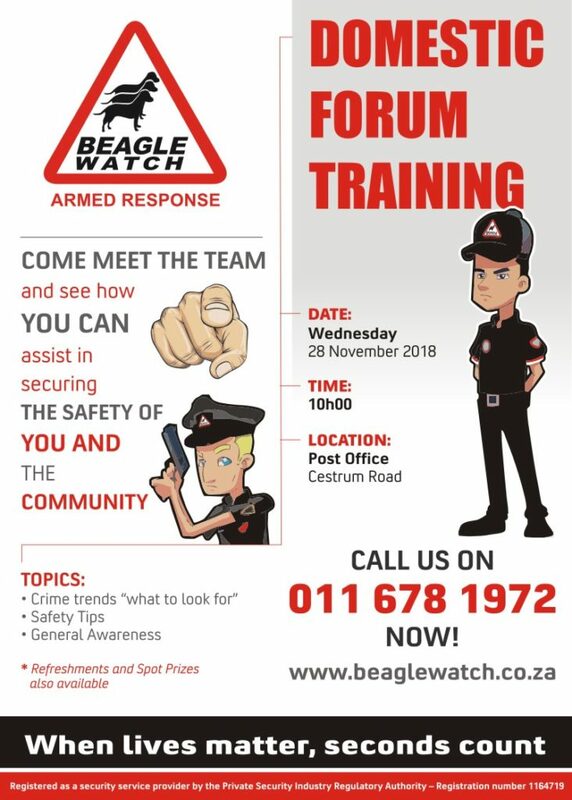 Please encourage your domestic staff to head across to the Post Office on Centrum Rd to hear the latest crime alerts, new modus operandi, security procedures and so much more. It’s incredibly valuable and always worth their time! (Tuesday 13 November) – Three suspects were caught breaking into a Morningside property on Tuesday morning. CAPS responded to the alert and dispatched Tactical Units to search for the suspects. CAPS arrested two of the three men involved and recovered a number of valuables. Strengthen your perimeter security as much as possible. High walls PLUS an armed electric fence are a significant deterrent to criminals. ANYONE IN SANDTON HAVE A GUARD HUT TO SPARE? The Sandton Sports Club is urgently looking for a previously-loved Wendy House that can be donated to replace one that was damaged in a storm. Future plans include upgrading the entrance and building a permanent guard station. Funds, do however, need to first become available. Please contact the Sandton Sports Club if you are able to help! The Parkmore Community Association says that it has received notification of a proposal to change the intersection on Mattie Avenue. The proposed changes include increasing the size of the intersection to include access to the new Sandton Gate precinct. In brief, the aim is to help accommodate the flow of traffic from the precinct, along with a new intersection further down William Nicol towards Sandton Drive. Please lodge your own comment or objection. Alternatively, you can wait and sign the PCA’s recommendation.